Iron Maiden Hollwood Rockwalk Classic Rock Photo available from the Music Photo Archive of Chris Walter and Photofeatures for Media plus Limited Edition Photo Art Prints. 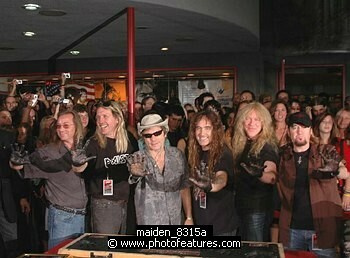 Photo Caption: Iron Maiden inducted into Hollywood Rockwalk at Guitar Center on Sunset Blvd in Hollywood, August 19th 2005. l-r Dave Murray,Nicko McBrain, Bruce Dickinson, Steve Harris, Janick Gers and Adrian Smith. Photo by Chris Walter/Photofeatures.